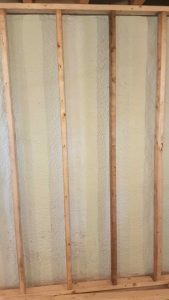 Continuous Insulation on Foundation Walls is a reality with the update to the Ontario Building Code. This is a good time for builders and renovators to look for sleek solutions that may be a bit outside what you have typically done in your builds. At Eco Insulation we are proactively looking for ways to help our Builders and Renovators adapt to the new requirements in efficient and economical ways while following the full energy efficiency and airtightness intentions of the new requirements. If you are not a builder, share this with your builder so we can get together to review the option more fully and show why the seamless, manufactured in place solution leads to a tight build like no other. A popular option our builders are looking to is a hybrid solution of Closed Cell Spray Foam behind the stud wall to R-10 followed by batt after the stud wall is built and electrical etc installed. 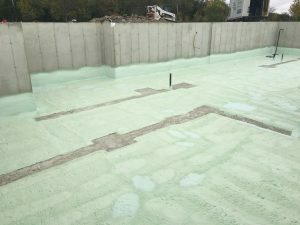 This has the added benefit of providing a much more appropriate vapour barrier (closed cell sprayfoam [NOT open cell] is a vapour barrier at 1.5″ thickness – when applied to concrete it is actually a vapour barrier at 0.5″) for foundation walls – keeping moisture out rather than trapping it in wall cavities. This solution is more cost-effective than even the cost of materials alone when looking at rigid board insulation such as Roxul Board. Why stop at required upgrades? 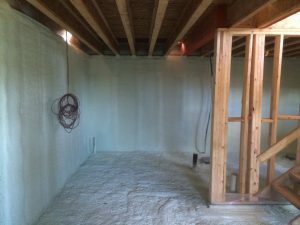 Under slab spray foam also saves you time and often saves you money, especially in complex foundations. It is sprayed in place and ready to walk on in 30 minutes. All columns, plumbing vents, sump, drains penetrating the slab and walls are sealed during the same application. This insures seamless impervious work, with exceptional sealing properties, preventing underground gas infiltrations. Watch for a CCMC announcement from CUFCA this week on Radon prevention. Beyond its high insulation factor, CC SPF performs as an air barrier as well as a vapor barrier. 1” (25mm) of the product exceeds 500 times the air barrier material requirements and provides an air barrier system.